With Midwest Battle Buddies, founder Chip Neumann combines his love of man’s best friend and his deep gratitude for those willing to serve our country. 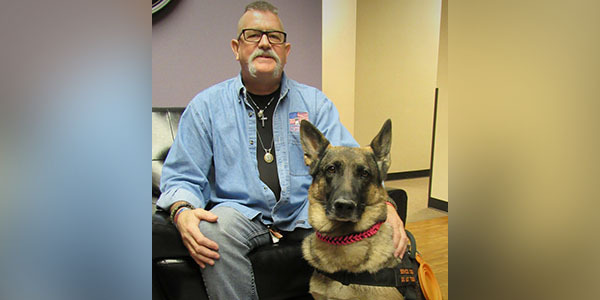 Two years ago, Neumann started the nonprofit that provides service dogs and training to military veterans living with PTSD, traumatic brain injury, military sexual trauma and other service-related conditions. While it costs about $30,000 to train a service dog, the only cost the veteran pays is the $20 application fee. “I just feel veterans have given so much and they deserve this service,” said Neumann. “It’s my way to serve them.” While Neumann never served in the military, his dad and uncle did. “We try to train for every situation so these dogs are practically bulletproof when they graduate,” said Neumann, explaining they go to malls and other places to conduct training among crowds, be in a dining situation and more. For both veterans and Neumann, the results are making a significant impact. Studies show that for veterans with PTSD, service dogs can have both behavioral and psychological benefits. For some veterans, the dogs mean freedom because they are no longer housebound by the fear and anxiety crowds can bring. The unconditional love and bond with the dog help keep depression and even suicidal thoughts at bay. Because the Veterans Administration doesn’t recognize service dogs as a treatment option, veterans who can benefit either have to pay for a dog and training themselves or rely on organizations like Midwest Battle Buddies. So Neumann – who funds this endeavor with donations and his pension from a nearly 40-year career as a printer – has now become much more than a trainer. He’s become an advocate, visiting with policymakers, helping the Robert J. Dole VA Medical Center develop a service dog behavior policy for its facility and making connections with similar training groups across the country. To find out more about Midwest Battle Buddies or to donate, visit midwestbattlebuddies.org. Ngoc Vuong knows the depths of despair caused by grief. But he also knows the impact of having a good support system. Vuong, 18, developed severe depression after his mom died of a brain aneurysm in his sophomore year at Wichita South High School. Already very involved with extracurricular activities dealing with leadership and volunteerism, Vuong decided to help other teens who deal with mental health challenges. 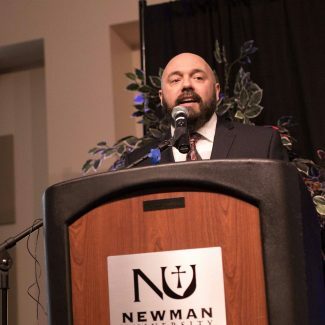 Not only did he start talking about his bout with grief and depression, but he worked with National Alliance on Mental Illness Wichita to start mental health awareness campaigns and wrote a grant to organize a community-wide initiative. Started with a $1,000 grant from the Wichita Community Foundation, ICTeens in Mind is a student-led mental health support and advocacy group that is forming networks with schools, neighborhoods, nonprofit organizations and communities to create resources for teens with mental health conditions. In 2018, ICTeens in Mind was integrated into Partners for Wichita, a nonprofit whose purpose focuses on making Wichita a better, safer place for its citizens. Growing up, Vuong listened to the stories his parents told him and his siblings about the hardships they endured as dissenters in Vietnam. His father fought against the North and ended up leaving his family and everything behind. His maternal grandfather was subjected to horrors in a “re-education camp,” while his wife and daughters tried to carry on until his release. “They found solitude in Wichita,” said Vuong. And he found strength, gratitude and drive in those stories – stories that showed hardships can be overcome. That’s why he started looking for opportunities to lead and make changes, he said, as early as middle school. It’s why he decided to do something about combating the stigma of depression. 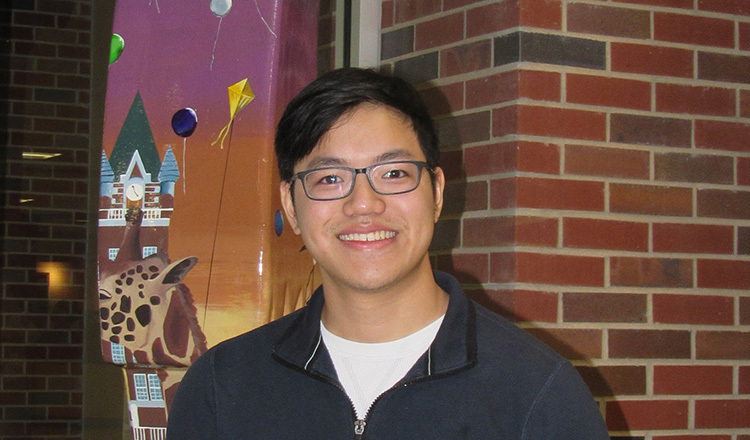 Now a freshman at Wichita State University and considering a degree in psychology, Vuong also works at Partners in Wichita and continues to find ways to expand the reach of ICTeens in Mind. “My goal is to encourage schools to be proactive in conversations with students and staff about mental health,” he said. He’s visiting area middle and high schools to talk to students and staff to get their input on creating programs focused on mental health, and he’s working on creating a countywide, student-led initiative. To find out more about ICTeens in Mind, visit the group’s Twitter page, https://twitter.com/ictymhc or Facebook page. 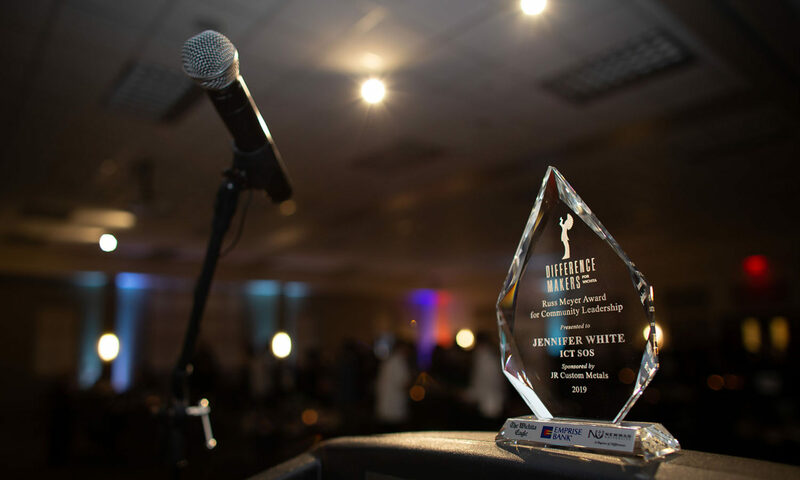 The second annual Difference Makers of Wichita Awards Banquet was held Feb. 24, 2018 at Newman University. Newman, along with The Wichita Eagle/Kansas.com and Cooks Heating and Cooling, sponsored the event. A total of 11 awards were given throughout the night. Five individual “Difference Maker” awards were given along with five “Everyday Hero” awards. Lance Minor, owner of Aero Plains Brewing, accepts the Murdock Award for Business. Aero Plains Brewing received the first Difference Maker award. 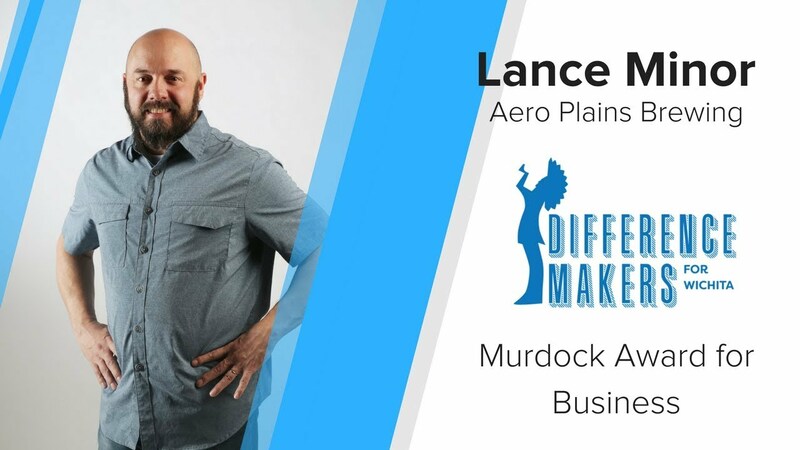 Owner Lance Minor accepted the Murdock Award for Business, an award sponsored by The Wichita Eagle/Kansas.com and given to a business in the community working to make Wichita a better place and help those in need. Minor is a Wichita native who lived all over the country during his time as a marine. He recently returned to his hometown and opened Aero Plains Brewing about a year ago. His wife Mary is very proud of him and he credits her for keeping him focused. The Ivonne Goldstein Award for Community Volunteer, which is presented to an individual who through outstanding volunteer community service and commitment is making a measurable difference, is named for the late Ivonne Goldstein, who served on the boards of or raised money for more than 50 Wichita organizations. 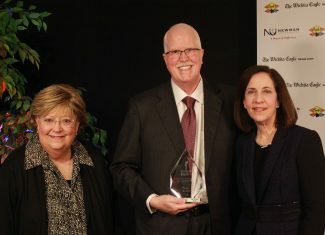 This year’s award was presented to Don Barry. Barry considered the late Ivonne Goldstein a good friend and was very humbled to receive an award named after such an extraordinary role model. It’s the ability to make a difference, and it may be in just a few people’s lives, or it could be hundreds of lives. But that is the drive behind it. 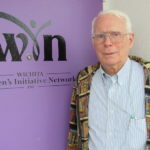 He has been a volunteer for organizations such as Interfaith Ministries, Goodwill Industries, Wichita State University, Wichita Public Library and more. His most recent accomplishment has been his role in the opening of the new Advanced Learning Library. Barry serves as a chairman of the Wichita Public Library Foundation. Kevin Mullen (right) poses with Robert Donovan of Donovan Truck and auto, sponsor of the Russ Meyer Award for Community Leadership award. 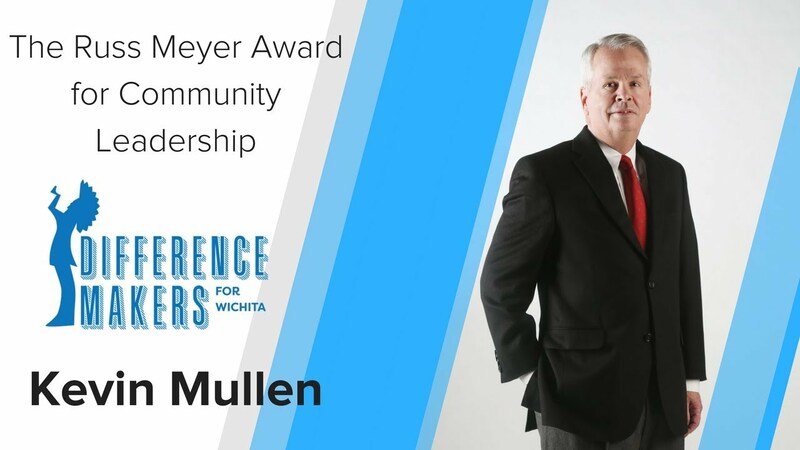 The Russ Meyer Award for Community Leadership is given to an individual making a positive impact in our community through demonstrated excellence in leadership and outstanding initiative to create solutions for critical issues facing the area. 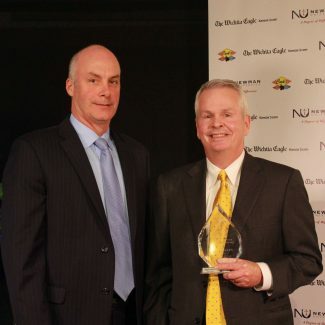 The award, sponsored by Donovan Auto & Truck, was presented to Kevin Mullen, president of Ritchie Associates. Lloyd Hanna poses with Sister Tarcisia Roths, ASC at the Difference Makers for Wichita banquet. The award is presented to a mission-driven not-for-profit organization that is creating a significant impact in the community. Hanna and his wife started the organization six years ago in their garage. Hanna found it ironic that Roths was presenting the award because she was, in fact, one of the first donors to the Medical Loan Closet. Simpson Construction sponsored the Brian Bergkamp Student Service Award, which was given to high school senior Hailey Colborn, founder of Self Posi. She and other members help young girls learn the importance of self-love. Hailey Colborn, founder of Self Posi. Colborn started the organization because of her involvement in pageants. She was told she needed to develop a platform, and at the time she was 13 and struggling with self-image issues. 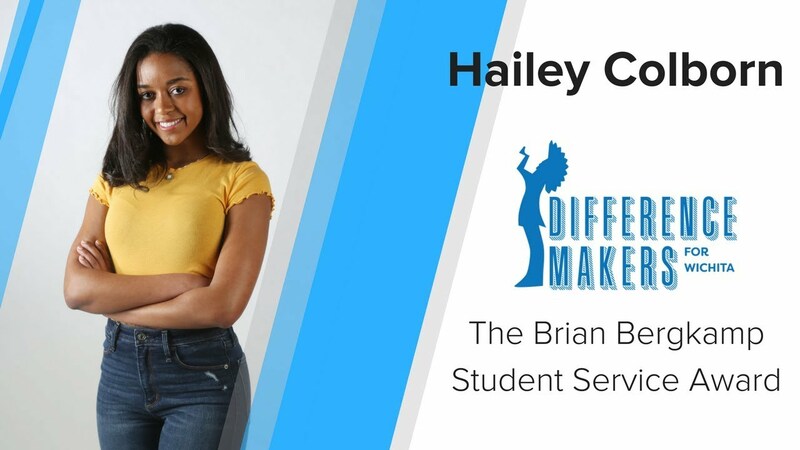 She has impacted hundreds of girls in the community by speaking to them about self-positivity and being willing to listen to any issues they’re having. 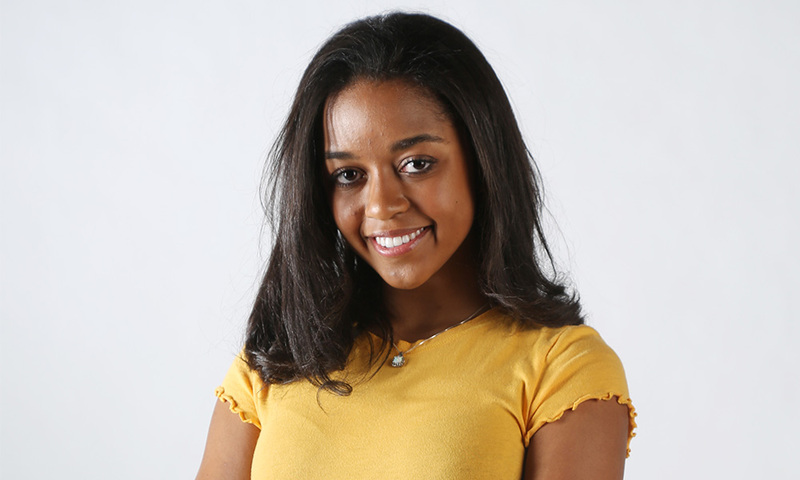 Colborn will major in political science at Princeton and is also prepping for Miss Teen USA. Among those honored at the banquet, five Everyday Hero awards, sponsored by Envision, were presented to community members. The recipients are individuals who do not seek recognition but rather are inspired by an unwavering commitment to the day-to-day service of others to make a positive difference. The first honoree was Michael Pasco, who started “Coffee With a Cop” at the age of 17. The idea was to help improve trust and build relationships between citizens and law enforcement. About 10 people showed up to the first event in November 2015. Now, the event hosts crowds of more than 300. Larry Hanafin was honored for his tremendous amount of work on the Christmas light display The Arc of Sedgwick County prepares each year. He plays a vital role in the creation and disassembly of the display that The Arc considers their premier fundraiser. Janelle McGee brings Broadway to the senior citizens of Brookdale Senior Living. She enjoys performing pieces from popular shows such as Phantom of the Opera and knows how much the residents appreciate her creativity. Bob Lutz is a familiar name around Wichita. Lutz was recognized as an Everyday Hero for starting League 42, a baseball league for boys and girls ages 5-14. Lutz calls it a labor of love. He enjoys giving youth an affordable way to get out there and play. Jean Pouncil-Burton founded the Wichita Griots, a group considered one of the 15 affiliates of the National Association of Black Storytellers. The Griots present at schools and other organizations to tell stories, teach character education, and promote literacy. Bath stools and grab bars. Support rails and transport beds. Electric wheelchairs, crutches and canes. Used equipment distributed by the Medical Loan Closet may not be glamorous, but it makes a huge difference in the lives of recipients. Lloyd Hanna, retired owner of a drywall company, started the nonprofit in 2012, when he was 72. Hanna heard about a similar charity in North Carolina on National Public Radio and thought “why not here?” Hanna telephoned the N.C. organization to ask if he could try something similar here and got the go-ahead. A gold Ford F-150 served as his first office and mobile warehouse. Today, there’s a 10,000-square-feet storage warehouse at 6655 E. Harry that the organization utilizes through a generous arrangement with a supporter. Hanna made about 50 loans the first year. At last count the total is about 8,000. Wheelchair ramps and toilet seat risers are just some of the other items the Medical Closet has saved from the landfill. 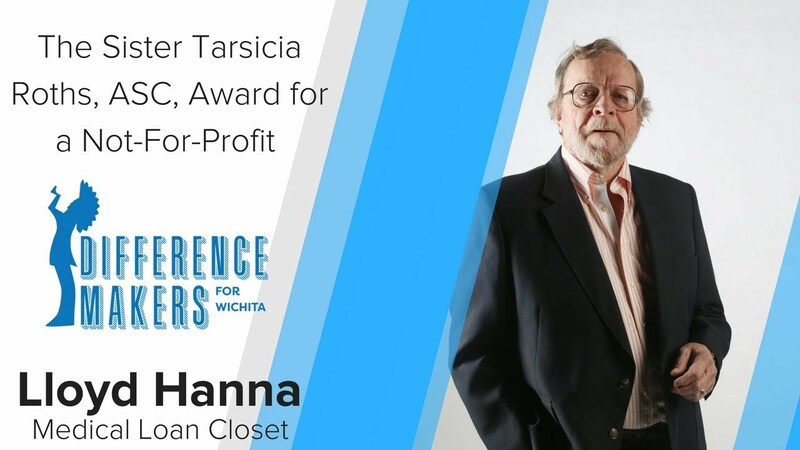 Hanna is the 2018 recipient of the Sister Tarcisia Roths award for not-for-profits. The Medical Loan Closet receives no government funding. Its primary source of what is known as “durable medical equipment” comes donations of cash and equipment from the Wichita area. Donated equipment is inspected, cleaned and repaired if needed before being added to the inventory. Recipients are those with little income and little or no insurance. Those who can pay a fee of $5 to $25 for the loan, which is open-ended. The application is one page. 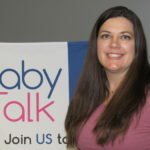 Hanna believes the Medical Loan Closet saves taxpayers money, noting that some of the donated items were initially paid for through Medicaid or Medicare. A majority of recipients return the items when they’re done, he said, and he often receives additional useable medical equipment as well. Hanna says his desire to help people may stem from the fact that he is a polio victim assisted by the March of Dimes. A mission trip to Guatemala raised his awareness of poverty. The Closet has expanded to Winfield, Pratt, Garden City and Denver – thanks, Hanna said, to volunteers in those places. With his wife, Elaine, five children and 11 grandchildren, Hanna has plenty to keep him busy. He’d like to retire from this second, unpaid job by the age of 80 – next year — but still has a couple of goals, the biggest of which is linking Medical Loan Closet online with similar organizations around the country and world. The organization has already helped missions ship items to Guatemala and El Salvador. Yet another Medical Loan Closet initiative has been created by a volunteer who has a handicapped child. She’s created a Facebook page of families with similar needs, sending items to 12 states and two foreign countries. “We want to grow this effort,” Hanna said. Lance Minor came to know himself well while serving 21 years in the U.S. Marine Corps. He knew he loved the excitement of active duty, loved leading younger Marines. When he retired and returned to his native Wichita in 2012, Minor wondered how he’d find that same kind of challenge. The answer was starting a microbrewery – Aero Plains Brewing – with a little broader purpose than just cranking out good beer. 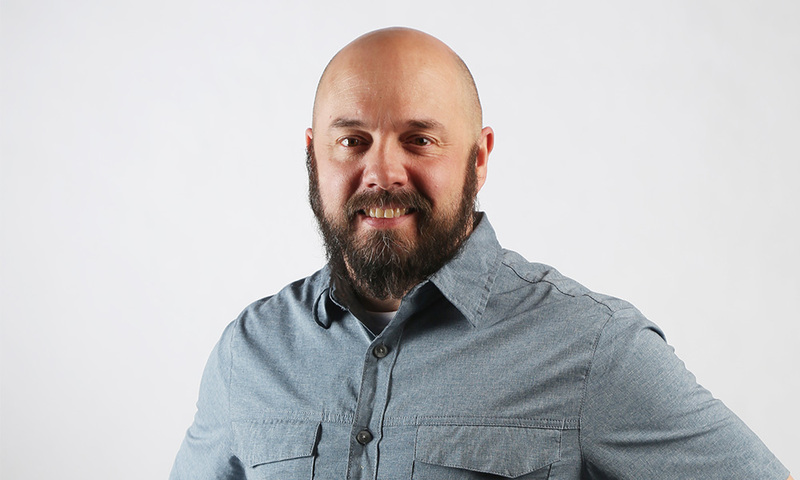 “By making and serving beer and connecting with the people of Wichita, Aero Plains has allowed me to continue to serve something greater than myself,” Minor, CEO of Aero Plains, said. Aero Plains does serve very good beer, by the way. It was named “Best Kansas Brewery” at the 2017 Midwest Beerfest. Minor is the recipient of the 2018 Murdock Award for Business. Minor and co-founders Ryan Waite and Brent Miller opened Aero Plains in October 2016. Other than a little confusion over its location – 117 N. Handley, tucked behind Bicycle X-Change in the Delano neighborhood – the reception has been everything they hoped for. Minor says his “old soul” wife, Mary, and Aero Plains’ “beer ambassador,” Mike Snider, have also made key contributions. Minor created the original recipes for Aero Plains’ beer. Minor and his partners have also listened to input from customers who want more variety, recently hiring a new head brewer, Troy Bervig. They’re working with a local branding agency, Gardner Design, to improve their labels and recently purchased equipment that will allow them to switch from bottles to cans. That, in turn, will allow them to release new beers more often. Aero Plains has raised money for the Mental Health Association, Hands of Hope, Wichita’s Littlest Heroes and women’s advocacy groups. Minor sits on the board of the Field of Brews fundraiser for Starkey, Inc. He and Aero Plains are enthusiastic participants in the Delano Fall Fair and other neighborhood events. In his professional life, Kevin Mullen builds nice homes and neighborhoods for people who can afford them. In his personal life, he helps feed people who can’t. Mullen considers himself lucky in both respects. 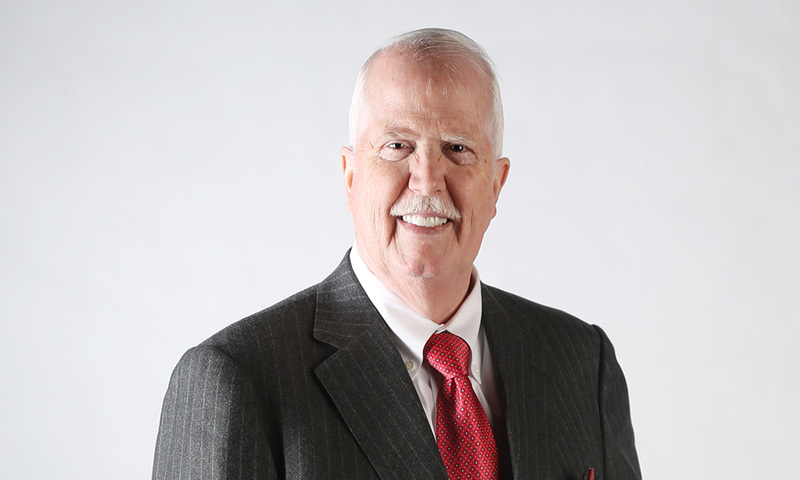 Mullen grew up in Hutchinson, earned an accounting degree from Kansas State University and worked as a CPA for three years before going into the real estate development business with Jack and Dave Ritchie. Today he and Jack Ritchie are partners. Their company has transformed east Wichita, creating dozens of developments with thousands of homes in them over the past three decades. Tallgrass, Wilson Estates, Lakepoint, The Waterfront, Garden Walk … the list goes on, literally, with the company’s newest developments, Brookfield and Firefly. As good as he is with numbers, Mullen’s real satisfaction comes from seeing his company take an empty landscape and fill it with a thriving neighborhood, using as much of the landscape’s creeks, woods and natural features as possible. Maybe it’s a link to his father, Robert, an architect and artist. “We feel like our model of neighborhoods have changed the way Wichitans think when buying a home,” Mullen said. Mullen has not joined many boards through his life. He describes himself as direct, driven and not inclined to talk situations to death. However, he accepted an invitation to join the board of the Lord’s Diner in 2009, after the recession left him with a little time on his hands. He helped the organization expand from its original site on north Broadway into a second location in south Wichita and three mobile food trucks, increasing the number of meals served daily from about 500 to 2,500. Twice a month, he dishes up food at the truck parked at the Atwater neighborhood center in northeast Wichita. On those nights, he says, he’s just one of 6,000 volunteers from all faiths and backgrounds who pitch in to make the Lord’s Diner work. He recently left Lord’s Diner board and joined the board of Catholic Charities. True to his nature, he plans on doing more listening than talking while he figures out where he can do the most good. He’s also been active in developing the Stryker Soccer Complex in northeast Wichita and helping Kapaun Mount Carmel, which his children attended, build a new gym. Mullen said any success he’s experienced would have been impossible without his partner, Jack Ritchie, and his wife of 43 years, Nancy, another K-State Wildcat with whom he has four children and six grandchildren. Don Barry loves the public libraries he grew up with – depositories of so much knowledge, free for the public’s use. Still, he can’t wait for a new kind of library – Wichita’s $33 million Advanced Learning Library – to open this spring. If he wasn’t, they’d be tears of joy. Barry was first appointed to library’s board of directors in 1980. At the time, he was working as a machinist at Boeing while studying at Wichita State University. 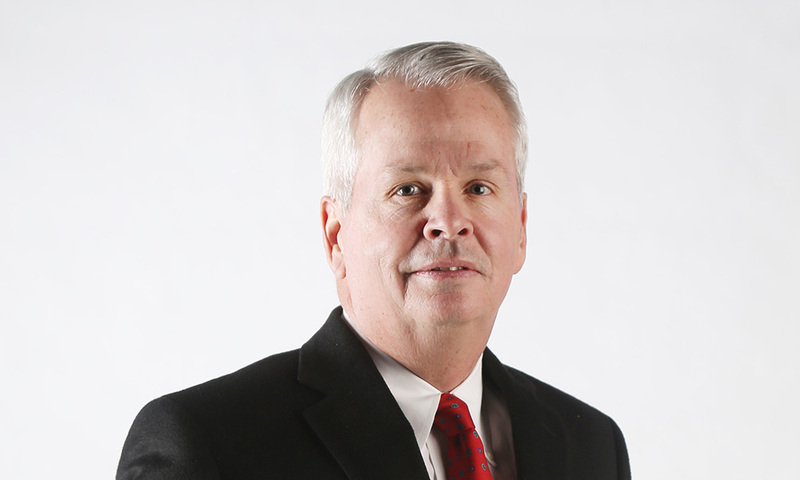 He’s worked as a financial advisor since 1981 and is now a managing director at Baird. Barry is the 2018 recipient of the Ivonne Goldstein Award for Community Volunteer. Barry was library foundation board president in the mid-2000s, when a study recommended that a new library be built across McLean Boulevard from Exploration Place children’s science museum, creating a kind of educational district along the Arkansas River. Then he watched as the recession and politics delayed the groundbreaking for another decade. Barry left the library board but remains a member of the library foundation’s board, which raises funds for the institution. It’s fitting that Barry should be named the Ivonne Goldstein Award Winner. 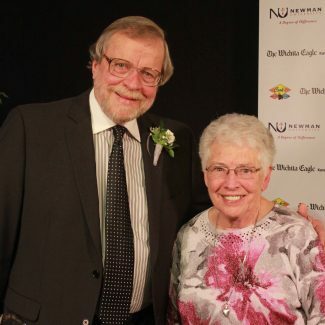 He first got to know her while both were serving on the board of Interfaith Ministries in the 1980s. 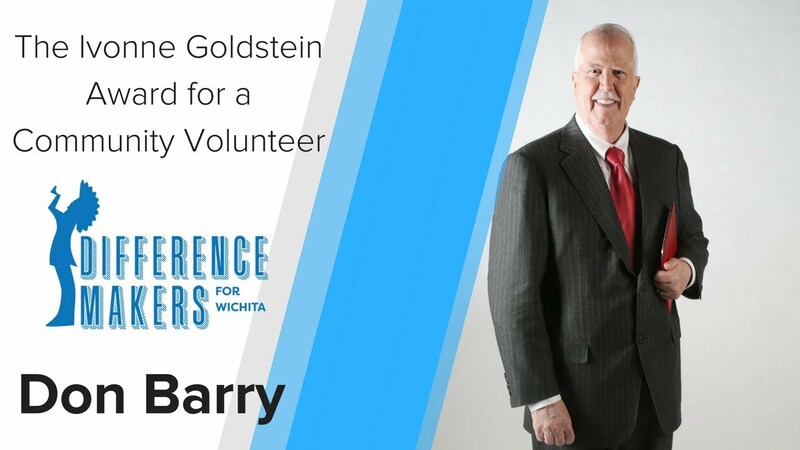 In addition to the library foundation, Barry serves on the boards of Goodwill Industries and Wichita State’s National Advisory Committee. 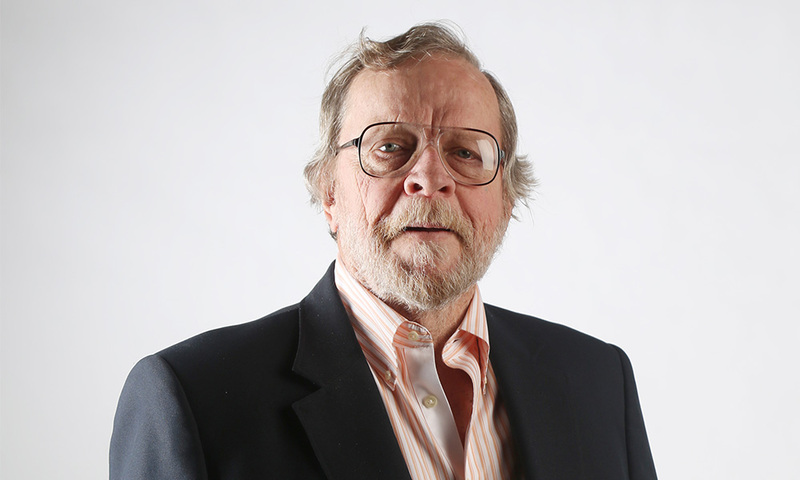 He’s previously served on boards of the Via Christi Hospital Foundation, National Conference of Christians and Jews, Humane Society, Arts Partners, Wichita Community Foundation and Exploration Place. From city officials to the library staff, members of its board and volunteers, Barry called the realization of the Advance Learning Center “an extraordinary team effort.” The new library, located at 711 W. 2nd, features a 10,000-square-foot children’s area, 100 computers, a coffee shop and several community meeting rooms. It’s hard to imagine today, but Hailey Colborn struggled with self-esteem as a youngster. Yes, the reigning Miss Kansas Teen USA, former Northwest High class president and ballerina who danced the role of the Dew Drop Fairy in “The Nutcracker” last year. Colborn, the Brian Bergkamp Student Service Award winner who will graduate from Northwest in May, started a program called SelfPosi three years ago to help girls with some of the same issues she faced. Originally part of a platform for a pageant she was competing in, she first tried SelfPosi out on fellow students at Northwest. Realizing the message was needed even more by younger girls, she has directed her efforts toward middle schools. A program she organized last April at McAdams Recreational Center drew more than 50 girls ages 10 to 16, who took part in workshops on issues underlying self-esteem free of charge. Hailey is the daughter of Kevin and Denise Colborn. When not maintaining a 4.0-grade point average or volunteering for extracurricular activities, she enjoys hanging out with friends and her two dogs. She’s also a “literature fanatic” – particularly when the writers are F. Scott Fitzgerald or Toni Morrison. 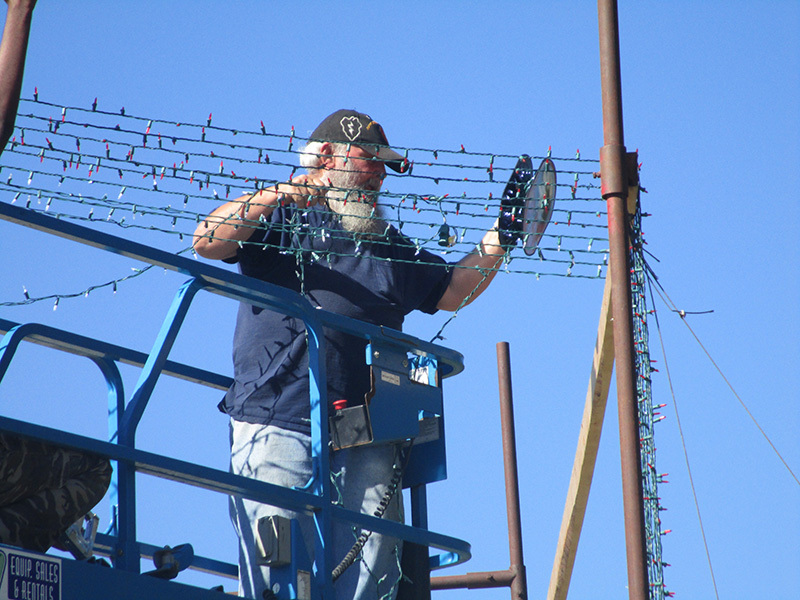 For the past 15 years, retiree Larry Hanafin has been helping the lights shine bright for one of the Wichita area’s most popular holiday displays. Now the volunteers and staff of The Arc of Sedgwick County want to shine the light on Hanafin’s efforts as a volunteer for the nonprofit organization that offers various programming to make a difference in the lives of individuals and families living with intellectual and development disabilities. The Arc’s Lights holiday display features 1.4 million lights and 20-plus miles of electrical and extension cords, enough to go from Wichita to Newton, according to The Arc officials. The most recent display – starting at the intersection of Douglas and St. Paul in west Wichita and continuing through the grounds of The Art and the adjacent Independent Living Resource Center – was open nightly from Nov. 23 through Dec. 28. The light display, held for the past 21 years, is the premier fundraising event for The Arc. Volunteers such as Hanafin start work in September on the display by testing the lights to see if they work. Then the displays are assembled. In January, the display is disassembled, an effort Hanafin also participates in. “I’m the high man,” said Hanafin. “I do all the displays that need a lift.” His signature creation is a tunnel of lights. “He’s a huge part of our life here,” said Sarah Maddux, The Arc’s special projects assistant and volunteer coordinator. “He loves to give of his time for people who need it,” added Mike Kelly, program director. The Arc has become his saving grace, the 69-year-old Hanafin said, a place for the former Vietnam War veteran of the 25th Infantry Division to be part of something positive and rewarding. “This has become my lifeblood,” said Hanafin, who also serves as one of two Santas during holiday parties for The Arc’s clients. He and his wife, Brenda, also serve as chaperones for several local and out-of-state trips for The Arc’s clients. They’ve been to the Grand Canyon, Nashville, Branson, Missouri, and various other locations, and even a cruise in Mexico. “We’ve gone a lot of miles,” Hanafin said. He started volunteering about 15 years ago, when one of his daughters, who was working for one of The Arc’s programs at the time, told him that organization needed help setting up its holiday display. She thought it would be an ideal place for him to share his skills – and his giving nature. After his 18-month stint in the Army, Hanafin had spent decades working in maintenance, including 25 years at the Boeing-Wichita plant. One of his major hobbies is collecting and restoring vintage cars. “There’s not much on a car that I can’t fix,” he said. The 1945 Dodge pickup he drove back and forth going to high school in Valley Center and the car in which he learned to drive are among his car collection. Seeing an Arc client’s face light up when he plays Santa or helping someone make memories of a lifetime during an out-of-town trip are particularly special for Hanafin. Once upon a time, there was a fascinating woman who loved to tell stories. She’d read aloud from books, raising and lowering her voice as the story dictated, switching voices as the characters changed. Sometimes she’d recite stories from memory – folk tales, ghost stories, historical stories and more – exciting her audiences with gestures and sound effects to accompany a voice that demanded attention. 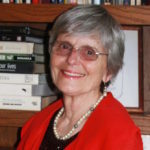 Jean Pouncil-Burton loves introducing children to the powerful medium of stories, as told in books and in the oral tradition. “I love to tell the stories so profoundly that the audience can see the characters and not forget them,” said Pouncil-Burton. But it’s her story that deserves to be told, according to her nomination for February’s Everyday Hero award. Twenty years ago – after spending more than three decades as a Wichita public librarian – Pouncil-Burton founded the Wichita Griots: Keepers of the Stories. It’s a group of about a dozen storytellers who preserve the art of storytelling and the spoken word by presenting programs at schools and other organizations to tell stories, teach character education and promote literacy. Griots is a West African term used to identify storytellers and musicians. The Wichita Griots are one of 15 affiliates of the National Association of Black Storytellers. The Griots also hold local storytelling workshops throughout the year and a summer cultural arts camp for Wichita youth where “kids use their imagination to grow,” said Pouncil-Burton. During the weeklong arts camp, students ages 6 to 16 are exposed to a variety of arts – from drumming to dancing to reading and drama. The camp culminates in a major production staged by the kids to showcase the talents they acquired. 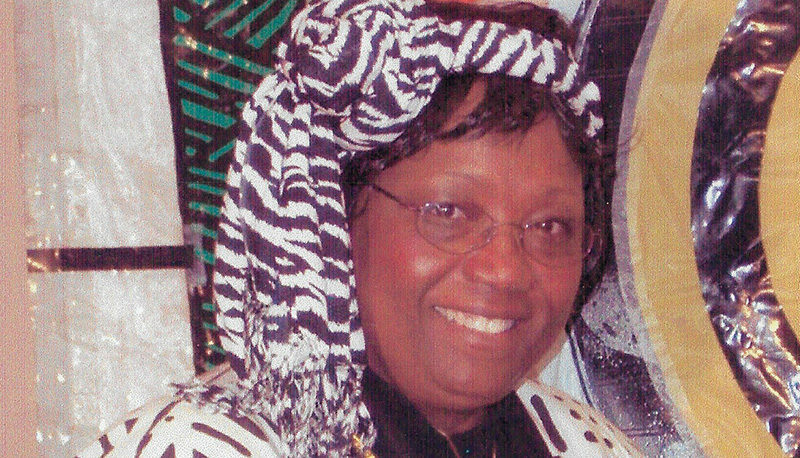 Pouncil-Burton has had a a lifelong love of books and words, encouraged by her mother and a specific teacher from her youth, Ms. Mildred Robinson. “Laura Ingalls Wilder’s books held me hostage for hours on end,” recalled Pouncil-Burton. She later discovered the books and poems of African-American writers Langston Hughes and Paul Laurence Dunbar. She still loves being transported to different places and learning about the characters she finds between the covers of a book. As a librarian, Pouncil-Burton enjoyed encouraging youth to discover books, as well. As the manager at the Maya Angelou Northeast Branch Library, she would often recommend books to children to read while they waited their turn to use the library’s computers. “The next thing you know it would be time for them to use the computers but they’d be in the stacks, reading,” she said. She would then encourage them to check out the books to continue their reading. “I was so inspired when I saw that,” she said, of turning young children into readers and public library users. Her storytimes also gained in popularity, leading many parents and teachers to ask her to come to parties or classrooms to share her enthusiastic readings. “When I retired early, I thought, ‘I can’t leave those kids. I love encouraging them and turning them into readers,’” she said. So she founded the Griots in 1998. Pouncil-Burton said the Griots reach about 24,000 people each year through presentations, programs and community events. The Griots’ summer camp, now in its 14th year, outgrew its original location at North Heights Christian Church and is now held at the Wichita Urban Preparatory Academy, based in the former Mueller Elementary School. Grant funding – from organizations such as Westar Energy and local arts groups – helps keep registration to an affordable $30 per child, with sibling discounts, for the 40-hour camp, Pouncil-Burton said. A grant from the Wichita Community Foundation and the Wichita Wagonmasters Fund will provide scholarships for six students this year. Difference Makers of Wichita is created in partnership with the Wichita Eagle and Newman University.